Fun In The Poser Material Room ! 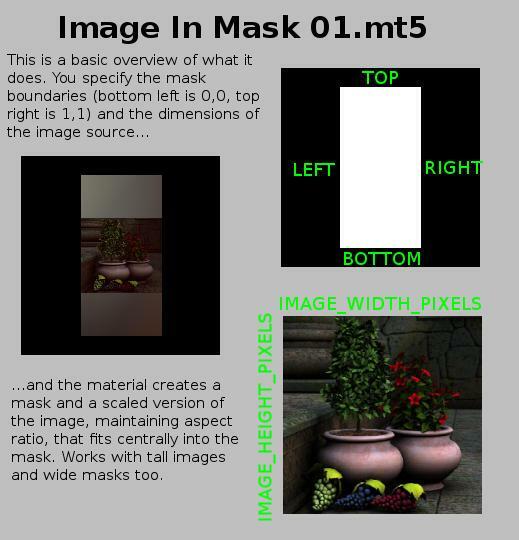 This is a Poser material (created in Poser 6) that allows you to define a mask rectangle and automatically scales the image to fit centrally into that mask. It maintains the image's aspect ratio so there may be blank areas at the left/right or top/bottom if the aspect ratio of the mask doesn't match that of the image. The promo image shows the important details. The second image is a screenshot of the material room - yay, spaghetti everywhere ! I created this as a first step towards an easy method for putting any picture I want into Hypnagogia's Mirror Frame (here at ShareCG) and other similar props. More work to do - I want to add options to stretch the picture to fill the mask (i.e. ignore aspect ratio), and to fill the mask by maintaining the picture'saspect ratio and cropping it.The maths is easy, the nodes area little trickier. And of course I want to make a compound node version. No readme. Just copy the contents of the runtime in the zip into whatever runtime you want to put my stuff. Yet another fine product from the goblin sweatshops of the 3DCheapskate ! Thanks.I think I've worked out how to add the 'Crop' and 'Stretch' options to the network so there'll hopefully be an update soon. infinity10 (1 year ago) Inappropriate? off to fix that !